This pairing of a blue denim jacket and a Zac Zac Posen Eartha Swarovski Crystal Mini Bag is hard proof that a safe off-duty ensemble doesn't have to be boring. Feeling bold today? Switch up your look by rocking black sequin low top sneakers. 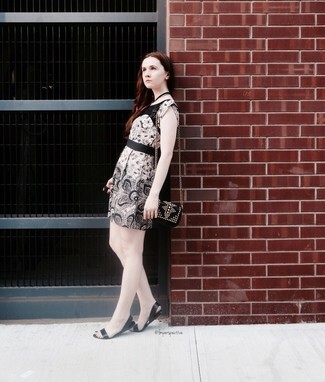 Choose a beige print lace shift dress and a Zac Zac Posen Eartha Swarovski Crystal Mini Bag if you're scouting for an outfit option that is all about off-duty chic. We're loving how a pair of black leather flat sandals makes this outfit whole. This combo of a black quilted leather biker jacket and a Zac Zac Posen Eartha Swarovski Crystal Mini Bag is definitive proof that a pared down casual outfit can still be really interesting. Complete this outfit with black leather pumps to completely spice up the ensemble. Want to infuse your wardrobe with some fashion-forward style? 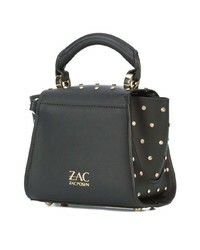 Wear an olive parka with a Zac Zac Posen Eartha Swarovski Crystal Mini Bag from farfetch.com. If you're all about comfort styling when it comes to fashion, you'll appreciate this absolutely chic combo of a pink fur jacket and a Zac Zac Posen black studded leather crossbody bag. Introduce black leather lace-up flat boots to your outfit to tie the whole thing together. Stay stylish and comfy on busy days by wearing a black lightweight trenchcoat and a black studded leather crossbody bag. Let your outfit coordination credentials really shine by finishing off this getup with black leather ankle boots. This combination of a tan quilted leather biker jacket and a Zac Zac Posen Eartha Swarovski Crystal Mini Bag is hard proof that a simple casual outfit can still look really interesting. Complete your getup with black leather wedge sandals to immediately ramp up the oomph factor of any look. For something more on the off-duty end, wear this combo of a green blazer and a black studded leather crossbody bag. As for footwear, complete your look with a pair of black leather lace-up flat boots. A white and black fur coat and a black studded leather crossbody bag? This is an easy-to-achieve look that anyone can work on a day-to-day basis. To bring out an elegant side of you, introduce a pair of black elastic ankle boots to this look.